Summer is here and already too hot for Zach to be wearing clothes. In my defense he had a darling brown jumper on that matched his shoes, but he poured water all over himself from his new water table (thanks Auntie Lauren!). 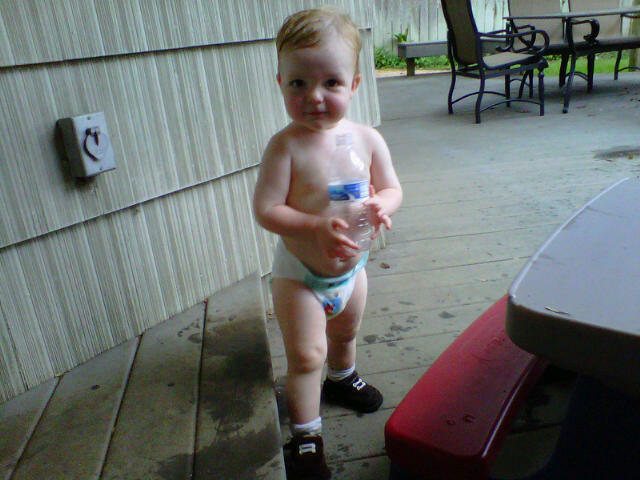 The deck was too hot for bare feet, and we were headed inside for a bath. But like most of the things I try to make him do, he decided he was not ready and ran back outside. He loves his table. He found it hysterical to dump out the water and cooled us both off with all his splashing. However, he was very perplexed as to why he was not able to drink the water like Norman did out of the table. He tried and tried, but just kept getting his face wet and laughing like a crazy person about it. When Alex saw this picture he thought that Zach’s hair was that wet from sweating. « I wonder why horses wear shoes? I'm glad I'm not the only one who lets their baby run around in a diaper. It's too dang hot for clothes! I just love his little belly.